Myth: Biodiesel causes filter plugging in cold temperatures. Fact: All diesel fuel requires special handling in cold weather. There are many factors that can cause filter plugging in the winter. When air temperature gets below 32°F, water freezes, including any water in the fuel system. The colder the temperatures, the thicker diesel fuel gets. It doesn’t take much to restrict the flow through today’s tighter fuel filters and any type of contamination will be more pronounced in winter – water, sediment, and oxidation can all lead to filter plugging. Filters in the fueling system are designed to capture these impurities before they reach your engine. Myth: Even low biodiesel blends, like 5 percent, lead to winter operability problems. Fact: Biodiesel blends of B5 and lower are physically similar and perform the same as petroleum diesel fuel. In fact, the specification for petroleum diesel, ASTM D975, includes biodiesel blends up to 5 percent for on/off road engines. Whichever methods are used to winterize No. 2 diesel fuel, the same strategy will work with biodiesel blends of B5 or lower. Myth: Biodiesel causes diesel to look milky and thicken during freezing cold temperatures. Fact: Paraffin is a naturally occurring material in petroleum diesel fuel. The “cloud point” of diesel refers to the temperature when the first wax crystals appear. When the temperature of the fuel is at or below its cloud point, more paraffin appears, sticks together forming bigger compounds and falls to the bottom of the tank. Wax anti-settling agent additives are used to keep paraffin from combining with each other and suspended in the fuel rather than collecting at the bottom of the tank where they can cause filter plugging. 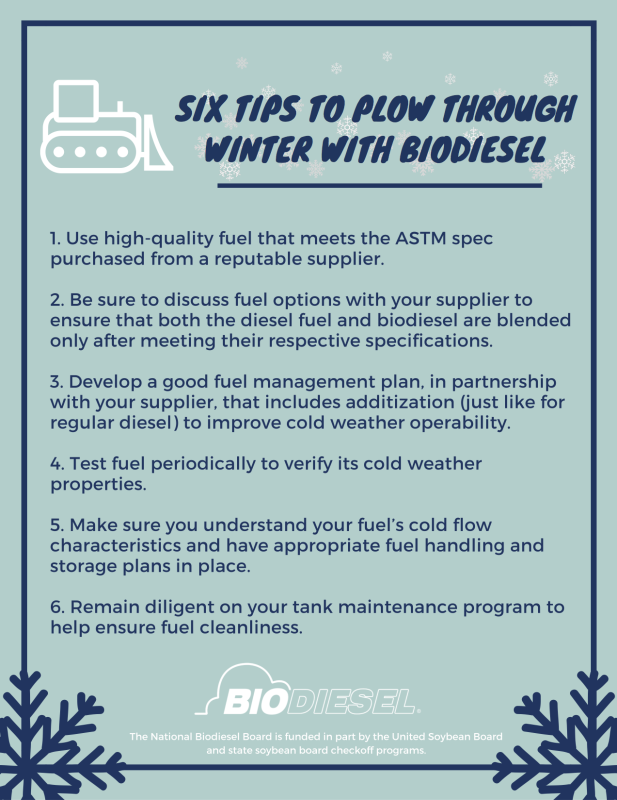 With just a little bit of care and upkeep that should be taken for all fuels, biodiesel can perform without the slightest issue during the upcoming cold months. The National Biodiesel Board is funded in part by the United Soybean Board and state soybean board checkoff programs.